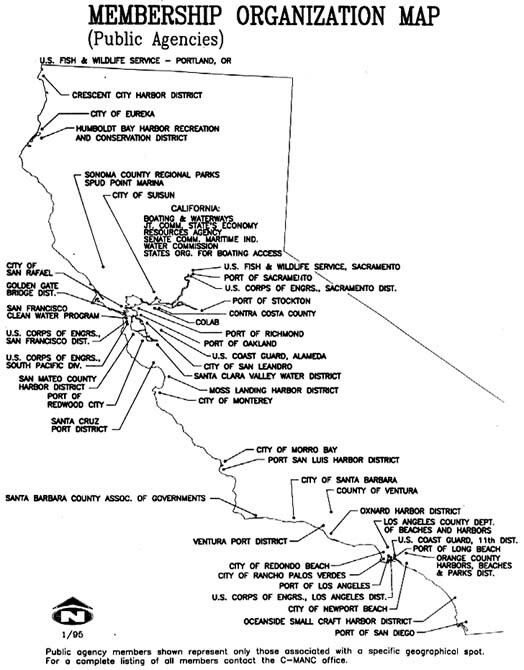 CMANC is a consortium of California harbors, ports and marine interest groups. The mission of CMANC is to optimize California maritime benefits by providing advocacy for the maintenance and improvement of California harbors, ports and navigation projects. CMANC works with the California legislature and congressional delegation to make sure that California maritime interests are supported by the federal and state government to the greatest extent possible. The Marine Affairs and Navigation Conference originated in San Francisco in the 1950's as a regional committee concerned with navigational civil works. It provided a common means and mechanism for regional ports, counties, and development agencies and others interested in navigational improvements, to join in seeking favorable public decisions and support of their projects. Such was the need for a statewide approach and coordination, to represent all interest, that Governor Edmond "Pat" Brown asked C-MANC to expand to take on that assignment. The result was testimony for the first time in 1959 for federal funding on a multiple-port basis. Current membership embraces a wide variety of public members, joined in common interests in support of commercial deep draft and recreational navigation projects, together with related undertakings, such as beach erosion, dredging impact, and taxing policies on navigation, seeking regulatory reforms, and to assure adequate recognition of the importance of commercial navigation, fisheries and water-related recreation. Membership does not restrict nor inhibit any member, public or industry, from exercising fullest right to present views, testimony or to take other actions, independently of or in opposition to those pursued by C-MANC. The Conference assures the fullest coordination and maximum support of its recommendations and testimony to the Congress, Corps of Engineers, Office of Management and Budget, State of California and to other Federal, State and local agencies as may be involved in navigation and related public works. By voluntary participation of public and private agencies and organizations, the Conference offers maximum input of planning, expertise and analyses toward meeting the needs of navigation, fisheries and water-related recreation, through efficient utilization of harbors, channels, waterways and coastal resources. Through its public membership and by liaison with other official bodies, the Conference endeavors to assure that the projects and programs that it supports best serve the general welfare of the State and the Nation. CMANC reviews proposals, legislation and administrative actions by government agencies which - if found to be without adequate consideration of all the elements involved in meeting the needs for navigation, fishing industry, coastal resources and recreation - or lacking appreciation of the impact of efficient, waterborne transportation and its security aspects - are modified or are opposed. Fullest Cooperation is provided to public and private agencies to maximize total ecological evaluation in all projects, and to incorporate environmental enhancement as a major criterion - with inclusion of economic well-being as part of such analyses. Membership meetings are scheduled by CMANC, with full sessions regularly held in the fall (in Northern California) and winter (in Southern California). They include business sessions, Board and committee meetings, hospitality and social events, spouse program and usually a tour or other organized inspection/orientation- of a project or activity meaningful to the membership. In addition to these regular, semi-annual meetings, there are other events providing opportunity to meet similarly interested and concerned members, port officials and others involved in C-MANC's objectives and activities. Each June, a special membership seminar is held in Sacramento, designed to increase the knowledge and effectiveness of members on behalf of their projects and interests, dealing with such subjects as project funding, regulatory and environmental issues, state legislative developments, disaster planning and the like. An annual highlight is "California Week on Capitol Hill" usually in April, scheduled by CMANC to carry out its role as the State of California-designated body to present coordinated formal testimony on behalf of port, harbor, coastal engineering and related federal projects. Coordinated events include the Waterways Roundtable Luncheon, group calls on key federal agencies and congressional members and their staff to exchange views and information, briefing sessions and an opening CMANC-sponsored reception. There is also a Caucus breakfast immediately preceding the calls on key federal agencies and congressional members and their staff. Since its inception in 1959, the C-MANC sponsored annual Golden State Reception during "California Week" has evolved into a social and gourmet highlight on Capitol Hill. With more than 500 guests in attendance, the foods, beverages and products of California are presented in a buffet format. A well-experienced team of CMANC member volunteers put the event together greeting guests and extending "California hospitality" wherever possible. Highly acclaimed and warmly appreciated, the Reception has become known for its opportunity to maximize contacts and meet people as well as renew acquaintanceships. It provides an ideal forum and format for displaying the variety of resources of the Golden State and demonstrating the appreciation through CMANC of the key role the Corps of Engineers, the Congress and the federal government in general, have played in the State's development.